5. Select "Back To Shop " to return to the website to add more items, or "Checkout" to go to our Secure Payment Server. 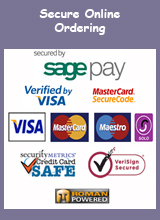 Our payment system is provided by leading card payment provider SagePay and is fully encrypted for your security. You enter the Secure Area when you select "Checkout"
If you have any problems ordering online or you have any special requirements, please email us with your order and we will be happy to help. We are always happy to accept purchase orders. You can email, fax or post them to us. We will send back a pro forma invoice by return. We do require payment in full for the order prior to shipping. We accept payment by credit or debit card provided you have an online security password (Verified by Visa or MasterCard Secure Code Systems). Otherwise payment is by Bank (Wire) Transfer. Please note that your Bank may charge you a fee to make a Bank Transfer payment. Payment is accepted by credit card from some countries outside the EU, please ask before ordering if you are unsure. For all other countries, payment is by Bank (Wire) Transfer only. Please ask if you need more details. Please note that your Bank may charge you a fee to make a Bank Transfer payment. Please ask if you need more details about any of our payment methods.